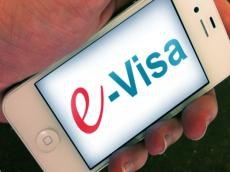 So far, about 900,000 electronic visas have been issued to foreigners wishing to visit Azerbaijan, while the most of this amount fell for the citizens of Iran, Elnur Niftaliyev, the Head of the Public Relations Department at the State Agency for Public Service and Social Innovations under the President of the Republic of Azerbaijan, said. He said that the top ten includes Islamic Republic of Iran (227,745), Saudi Arabia (68,073), Pakistan (66,755), Turkey (56,546), India (52,759), United Arab Emirates (43,402) Israel (37,949), Turkmenistan (34,044), Great Britain (31,147) and Germany (23,195), Report informed. Niftaliyev noted that starting from May 15, 2018, ASAN visas were issued at the airports with international status under the Decree of President Ilham Aliyev "On improvement of the process of issuing visas to the foreigners and stateless persons at the international airports of the Republic of Azerbaijan". Electronic visa is a document for a single entry, which determines the period of stay in the country up to 30 days. Standard and express electronic visas are available. Electronic visas are issued only to the citizens of the countries, approved by the Foreign Ministry of Azerbaijan, and stateless persons permanently residing in this country. Also, the ASAN Visa system offers the issuance of group visas to foreign citizens. Group appeals are provided for a minimum of two, a maximum of ten people. Currently, the portal is available in nine languages: English, Russian, French, Spanish, Arabic, Persian, German and Italian. Foreigners and stateless persons, who wish to receive an e-visa, must enter information into the system of "ASAN Visa", and after receipt on acceptance of confirmation pay online a state fee in the amount prescribed by law "On state duty". The system of "ASAN Visa" sends the appeal to the interagency automated retrieval system "Entry-exit and registration". The relevant executive authority verifies the information not later than three days from the time of appeal in "ASAN Viza", checks restriction list of the "Entry-exit and registration". Then a visa is sent to the e-mail address of the contact person. In case of failure the person is also informed. The electronic visas are not stuck in the passport but presented together with the passport while crossing the border check-point. Foreigners and stateless persons may apply for a new e-visa only after they will leave Azerbaijan. Only citizens of 95 countries (or persons residing in these countries) can obtain an electronic visa. The list of countries, which can be found in this link, is approved by the Ministry of Foreign Affairs of Azerbaijan. Azerbaijan applied electronic visa in order to make the process of obtaining the entry documents cheaper and quicker. Today foreigners can obtain electronic visa within three working days via "ASAN VISA" system in three steps (apply, payment and download). Electronic visa is issued to citizens of the country, which are approved by the Ministry of Foreign Affairs of the Republic of Azerbaijan and stateless persons permanently residing in those countries. At present, electronic visas are issued for foreigners and stateless persons through ASAN Visa system at the Baku, Ganja, Gabala and Lankaran international airports. The terms of issuing and using electronic visas through the ASAN Visa system were developed jointly with the Ministry of Foreign Affairs and State Agency for Public Service and Social Innovations under the President of the Republic of Azerbaijan. This step was taken for the promotion and development of tourism in Azerbaijan. ASAN Visa portal designed to simplify a procedure for issuing visas to foreigners and stateless persons wishing to visit Azerbaijan, as well as to ensure immediacy and transparency of this process, was presented to the public in 2016.